Ohio to Arizona Freight shipping and trucking services are in high demand; Columbus to Phoenix is a major route for freight shipping services. The Columbus, OH to Phoenix, AZ route is a 1,877 mile trip that takes a little over 27 hours of driving to complete. Shipping from Ohio to Arizona ranges from a minimum of 1,624 miles and 24 hours from Cincinnati, OH to Holbrook, AZ, to over 2,232 miles and a minimum of 32 hours on the road from Youngstown, OH to Yuma, AZ. The shortest route from Ohio to Arizona is along the I-44 W; however, there’s also a more southern route that just uses the I-40 W traveling through Louisville, KY instead of Indianapolis, IN. Arizona is one of the four corners states and home to the Grand Canyon. It shares one point with Colorado and borders New Mexico, Utah, Nevada and California. It also shares a 389-mile-long border with the country of Mexico. The southern part of the state is known for its desert climate, while the northern part has dense forests with variable weather. More than half of the state is made up of mountains, valleys and plateaus, with slightly over 12,500 feet between its highest and lowest points. The diverse climate and scenery draw an astounding number of people to the state each year, making tourism one of Arizona’s top industries. The Phoenix Metropolitan area is the most densely populated part of the state, and it is home to 65 percent of the state’s residents. Tucson and Flagstaff are also centers for Arizona freight and trucking. 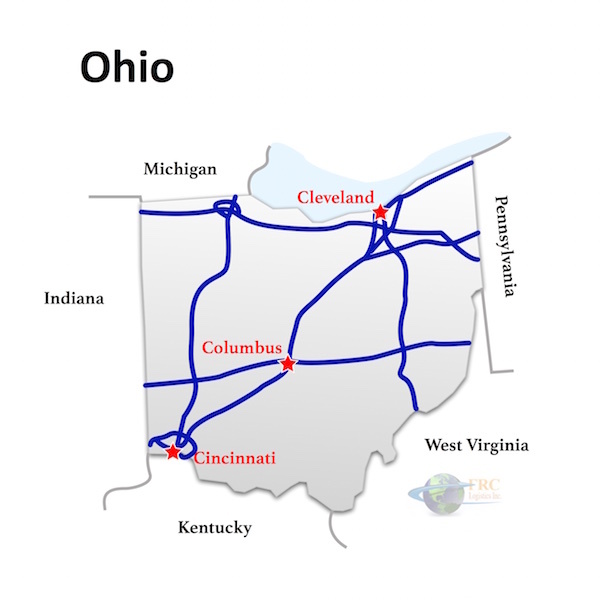 Ohio to Arizona Freight shipping quotes and trucking rates vary at times due to the individual states industry needs. Since Ohio and Arizona is mainly industrial, with manufacturing and distribution centers throughout, we see plenty of shipments by Flatbed as well as by the more common dry van trucks. Our Less Than Truckload (LTL) carriers in both Ohio and Arizona are also running a number of regular services between the two states, and it’s an active route for heavy haul freight shipments, as well.